The team's historic season may be over, but there is a lot to look forward to for next year. Saturday's 50-19 loss to Eastern Washington University was not the way the Black Bears wanted their season to end. "We wanted to win obviously," says Head Coach Joe Harasymiak. "To be a step away from a national championship and not really perform that well... it's tough." 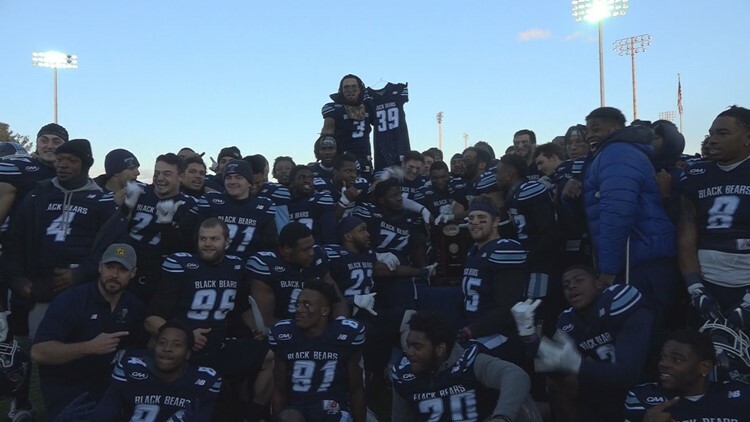 But the Black Bears have a lot to be proud of, including a win over an FBS opponent, a CAA title and a first ever final four appearance. Harasymiak says a lot of credit goes to the seniors and their leadership. He's losing some strong seniors, like All-America second team linebacker Sterling Sheffield, but his roster is full of eager underclassmen who are ready to make their mark. "I think it's 16 on paper, but depending on the game, 17 or 18 starters out of 22 are coming back. So we're young." Harasymiak is ready to bring in more top, young talent. Maine's recruiting will be helped by the nation-wide attention the team received this season. "Any time you can keep playing and be in a quarterfinal or national semifinal, being on national television two weeks in a row, getting that exposure in recruiting, it's huge," says Harasymiak. It's a big step in keeping this program consistent, and making sure runs like this years' team had are not few and far between. "Hopefully now there is a new standard for Maine football," says Harasymiak. "It's not going backwards and having a good year every three years or four years. We want to consistently compete for CAA Championships and be in playoff contention, and ultimately, I don't think it's unrealistic to start talking about National Championships at this place."